These Free Halloween Patterns Aren't so Scary to Stitch! From jack 'o' lanterns and black cats to ghosts and goblins, there's no shortage of imagery to stitch for Halloween! This collection of free Halloween hand embroidery patterns will keep you stitching spooks for seasons to come. Whether you're adding some creepy insects to your home decor or embellishing a tee with the cutest ghosts around, you'll find so many Halloween embroidery options, it just might scare you! These three Halloween Friends are simple, but oh so cute! They look great grouped together, but they'd also work well as individual patterns to make pins or patches. Kids and grown-ups alike will love stitching these designs. Julia from Stars and Sunshine shares the free patterns, along with how to frame them in one of her 3D-printed scalloped embroidery hoops. Eeeek! The last thing you probably want to see is a giant bug crawling along your vintage linens. But that's what makes this embroidery project so fun for Halloween! It's a subtle decoration that's unexpected. By stitching some creepy insects or a giant spider onto a table runner or placemat, you're sure to startle your guests. This project is part of the book Hoopla: The Art of Unexpected Embroidery and the PDF is shared as a special sneak peek into its pages. If you love primitive-style illustrations and designs, you'll love this free pattern created by Shirley of Hudson's Holidays and shared on Bari J's site, We Love French Knots. The black cat looks more spooked than spooky, and she's wishing you a jolly Halloween! Hudson's Holidays has plenty more Halloween patterns available too, including a set of framed character designs. What a sweet stack of Halloween friends in this free design! The ghost is holding a spooky sign, but they probably won't scare anyone soon. Which makes it a great pattern to stitch for kids! 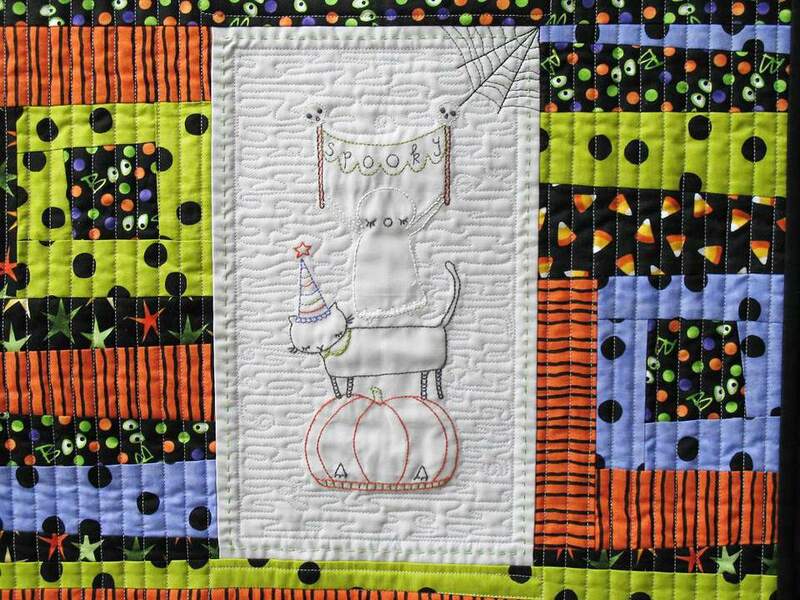 This adorable pattern was designed by Cathy Gaubert for one of Feeling Stitchy's stitch-alongs and you can see it stitched up in a variety of styles, including the mini quilt above, made by Marianne Penner. Inspired by vintage cameos, this set of printable designs from Flamingo Toes brings a bit of gothic styling to your Halloween decor. This amazing freebie is a collection of PDF files that you print onto fabric to create the full-color patterned background and oval as well as the embroidery pattern. Add as much or as little stitching as you want, then frame it up and display for Halloween! Is candy corn one of your favorite Halloween candies? With this free pattern and tutorial, you can stitch a piece of candy corn and turn it into a pin while practicing a few scattered fill stitches. Of course, they're all pretty simple, so this makes a great project to work on with kids or beginning stitchers. Best of all, even though it's a Halloween treat, it's one that you can enjoy for a whole season! Annie Oakleaves made some of the cutest patterns around, and while her shop is no longer open, she still has a few free designs available on Flickr, including these adorable ghosties all dressed up for Halloween. Of course, there's also a few spooky extras, so you'll have plenty of patterns to choose from! If you've always been a little scared to try stumpwork embroidery, a technique that adds dimension to your stitching, this ghost and tombstone pattern is a great place to start. Cate Anevski of Bee's Knees Industries shows you how to make the embroidered wired ghost that is floating out of this grave that's reminiscent of Edward Gorey. Her choice of pastel colors makes this a great juxtaposition, but you could work yours up using more traditional Halloween colors if you'd like. Dia de los Muertos, or Day of the Dead, isn't the same thing as Halloween, but the holidays do overlap. And since skulls are popular motifs for both, these decorative sugar skull embroidery patterns will work for whichever you're celebrating! Mollie Johanson from The Spruce shares them on her blog, Wild Olive. Whether you're making a set of simple Halloween coasters or stitching a t-shirt to show your holiday spirits, these sweet little hand drawn designs are quick to stitch and not too spooky. Anne at Green Jello shares these and a few other free patterns, including a pumpkin girl, a cat on a broom and more.